Eclectic Reader Challenge – Memoir – It’s Only A Movie – Mark Kermode. There were a couple of reasons for picking up this book. First of all, it fulfilled the memoir category for the Eclectic Reader Challenge but, as the last couple of books I have read have been a bit rubbish (Yes, Tell No One by Harlan Coben, I do mean you”) I knew I wouldn’t be disappointed. And of course, I wasn’t. In this book, Kermode imagines his life as a made for TV movie – a very funny idea which sees him detailing who would play him – Jason Isaacs – and his family members. It does seem as if spending so much time in front of a cinema screen has left Kermode with an odd view of reality and a lot of the episodes he recounts wouldn’t be out of place in a (slightly dubious) biopic. Maybe that is the point. The story starts with Kermode’s early cinematic experiences, moves through his love of horror, particularly The Exorcist, through his early experiences as a critic to the celebrity status he has today. The early experiences were the most interesting, I thought. Recalling as they do, a different era when going to the cinema was a more intimate experience. Y’know when cinemas had two screens and ran two features. It made me think about going to the cinema in the early eighties and I began to recall my own experiences. Although unlike Kermode, who seems to be able remember which cinema and when for every film he has ever seen, I can’t remember what I went to see first although it was undoubtedly a Disney rerun, this being back in the days before Pixar and Dreamworks and a whole business aiming to sell cinema to small kids. 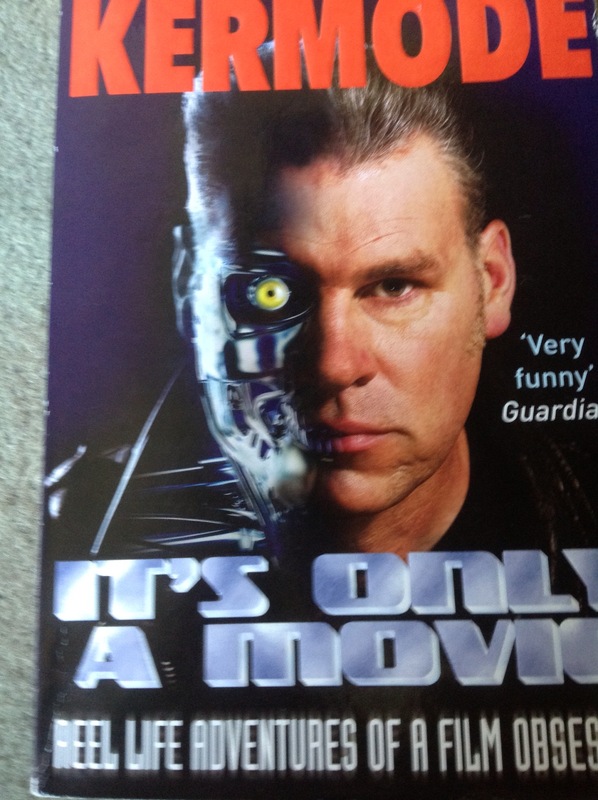 There is no doubt that Kermode is a geek – and I say this as a compliment – and a particularly grumpy geek, at that. (Amusingly a review of this, or possibly The Good, The Bad and the Multiplex, on Goodreads complained about this grumpiness as though it was a surprise. As if he had happened upon the book by sheer chance, knowing nothing about Kermode. It reminded me of when a friend went to see Billy Bragg and afterwards complained that he was too political. Well, duh.) He gamely outlines the number of people he was annoyed and irritated over the years including being put on the spot by Dame Helen Mirren after saying The Queen wasn’t a proper film and, my own personal favourite, getting punched in the arm by Benedict Cumberbatch on behalf of Kiera Knightley who resented being called Ikea Knightley on account of her plank-like acting style. A very apt description, if you ask me. Ultimately, this is a book about obsession and I think this is why Kermode can get away with his rants and raves. He loves cinema with his whole heart and hates the fact that some people do not give it the respect it deserves. It is only possible to remain calm about things that do not matter. Cinema matters an awful lot to Mark Kermode and thank goodness for that.